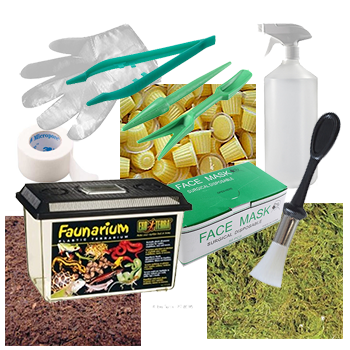 This kit contains all the essentials required to keep an adult male or female beetle. Please note that this kit does not support breeding as you need Larva Substrate, use Adult Kit 2 for breeding pairs. - Beetle handling tools: Forceps, spoon and probe to allow convenient handling of beetle and any resultant eggs. - Anti-pest tape: keeps mites and fruit flies from enclosure. - Humidifier: a 250ml Spray bottle to keep the faunarium moist. Note that all consumables in the pack can be bought separately in our shop. This bundle is an economical way to start your new hobbby.